Recently, the New Yorker ran a long, glowing piece on My Hollywood, When Both of Us Were Young. 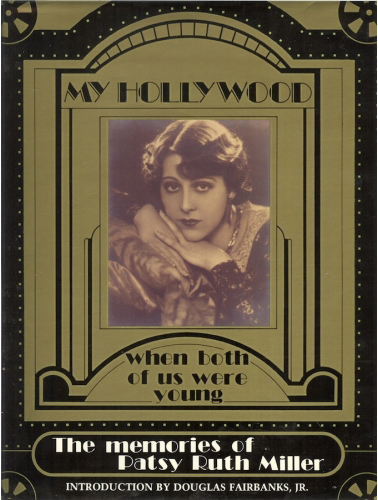 It is a little-known memoir by a largely forgotten film star, Patsy Ruth Miller (1904 - 1995). Today, she is best known as the actress who played Esmeralda in The Hunchback of Notre Dame (1923), opposite Lon Chaney. The occasion for Richard Brody's New Yorker piece was "It Girls, Flappers, Jazz Babies & Vamps," a two week, three dozen plus film series at the Film Forum in New York City. (The series continues through March 28.) Among the films being shown is Ernst Lubitsch's delightful 1926 comedy So This Is Paris, which stars Miller as the wife of a husband on the prowl. Curious, Brody read up on the actress and came across her memoir, issued by a small publisher in 1988, more than a half-century after the actress' career came to an end. Brody was impressed. He compared the book to Louise Brooks' classic Lulu in Hollywood, adding "If Brooks writes like Fitzgerald, documenting tragedy beneath the glamour that both charmed and repelled her, Miller is more like a Dreiser of anecdotes, endowed as she was with a seeming total recall, a photographic and phonographic memory that vigorously and artlessly conjures an era and its conflicts through the accretion of surprising details and precise, incisive observations." As praise goes, that's pretty good. Miller's My Hollywood is still in print, and today is available through BearManor Media. If you are not familiar with BearManor, they are a small press publisher specializing in popular culture and books on film, radio and television. Film International has called them an "independent maverick publishing house," while Leonard Maltin has noted their "impressive series of books for film, radio and TV aficionados." Since 2001, BearManor has done a commendable job issuing books on all manner of subjects. They, along with other specialty houses like McFarland and a handful of university presses, are helping fill out the shelves of film history. One newly released BearManor title worth checking out is Una Merkel: The Actress with Sassy Wit and Southern Charm, by Larry Sean Kinder. It's the first full-length biography of this quirky character actress who often played wisecracking best friends, harebrained ingénues, and cantankerous matrons. Once hailed by D. W. Griffith as "the greatest natural actress now in pictures," Merkel (1903 - 1986) was something rare in Hollywood. According to her biographer, she was humble, self-effacing, and almost egoless, confessing not only to insecurities, but an inferiority complex as well. Never aspiring to stardom, Merkel was more interested in good parts, which meant supporting roles to some of the biggest names of her day. Memorably, Merkel got into a cat-fight with Marlene Dietrich in Destry Rides Again (1939), and over the years supported such major stars as W.C. Fields, Harold Lloyd, Jean Harlow, Carole Lombard, Clark Gable, Jimmy Stewart, Spencer Tracy and others. Merkel's film career went into decline in the 1940s, but she would make a comeback as a middle-aged woman playing mothers and maiden aunts. She was Debbie Reynolds's mother in The Mating Game (1959), and was nominated for an Academy Award for Best Supporting Actress in Summer and Smoke (1961), based on the Tennessee Williams play. Her final film role was opposite Elvis Presley in Spinout (1966). Merkal was able to parlay supporting roles.into a noteworthy career that lasted more than forty years; she garnered acclaim not only in film, but also in theater, television, and radio. On stage, one early success came in 1927 in Coquette, which starred Helen Hayes. Later, Merkal won a Tony Award in 1956 for her role on Broadway in The Ponder Heart. Una Merkel: The Actress with Sassy Wit and Southern Charm is a detailed look at the career of a memorable performer, an actress with the special distinction of having played Sam Spade's secretary in the original 1931 version of The Maltese Falcon. For these and many other reasons, Kinder's book is a fun read. Along with indie presses like BearManor, self-published authors are also making noteworthy contributions to film history. Admittedly, some of their books are crap, but some have merit. 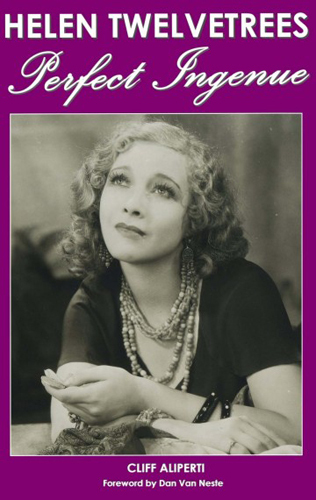 One of the better titles is another first-ever book on a significant early Hollywood actress, Helen Twelvetrees, Perfect Ingenue, by Cliff Aliperti. This Long Island writer and classic film buff runs a few different nostalgia websites about old Hollywood and vintage collectibles, including Immortal Ephemera, a site about unheralded films and film stars of the 1930s. In her heyday, Helen Twelvetrees (1908 - 1958) was a leading lady to male stars like John Barrymore, Spencer Tracy, and Maurice Chevalier. Her other early co-stars included Clark Gable, Joan Blondell, and John Wayne. Twelvetrees rose to fame in Her Man (1930). This film set the course of her screen career, and she was subsequently cast in a series of roles portraying suffering women fighting for the wrong men. Twelvetrees' ten years in Hollywood were highlighted by starring roles in a string of pre-Code melodramas. According to Aliperti, Twelvetrees was an "unexpectedly modern woman." Her independent attitude led to whispers of temperament, and that along with typecasting, studio realignment and a changing industry led to a loss in momentum in the actress' career. Twelvetrees made a film in Australia in 1936 before closing out her career in Hollywood in 1939. The faded star then left films for the stage. Helen Twelvetrees, Perfect Ingenue is one-half biography, one-half critical study of Twelvetrees' thirty-two motion picture, some of them good, some bad, a few lost. Aliperti's book is recommended. 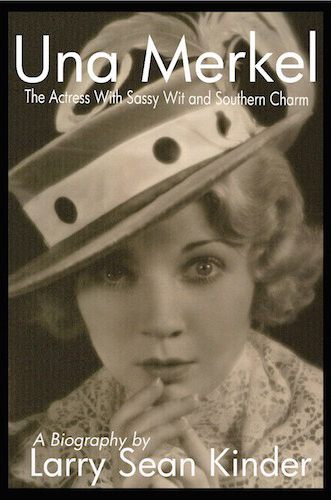 Another self-published book deserving mention is Sally Phipps: Silent Film Star by Robert L. Harned. The author is a professional research librarian based in New York City, and the son of his subject. Before you roll your eyes, know that this scrapbook style work is more than just a vanity project or book by a child about their parent. It's a labor of love, to be sure. But it's also the first book on its subject, and an enjoyable read ripe with appealing anecdotes and images. Sally Phipps (1911 - 1978) was a dish, one of the cutest stars of the silent era. More than just putting his mother on display, Harned sketches her fascinating story of her upbringing in the San Francisco Bay Area (her parents knew Jack London) and start in films as the toddler in Broncho Billy and The Baby (1914). That film was shot at the Essanay Studio in nearby Niles, California, where this three-year-old veteran of beautiful baby contests once sat on Charlie Chaplin's lap. Discovered by director Frank Borzage and signed to a contract by Sol Wurtzel, Phipps worked for Fox Studios, appearing in some 20 short and feature films. There was Bertha, the Sewing Machine Girl (1926), Love Makes 'Em Wild (1927), and The Cradle Snatchers (1927), as well as a uncredited bit in F.W. Murnau's Academy Award winning Sunrise (1927). Also that year, Phipps was selected as one of 13 Wampas Baby Stars, starlets considered destined for future success. A few more films followed, including Why Sailors Go Wrong (1928). After a contract with Howard Hughes failed to materialize, Phipps headed to New York. Her named popped up in the gossip columns, she appeared in a Broadway show, made a Vitaphone comedy short, and married and divorced one of the Gimbel department store moguls. Ever restless, she eventually left for India. Back in the United States, there was another marriage, two children (one of whom is the author), a stay in Hawaii, and ever-changing fortunes. In 1938, during the depths of the Depression, columnist Earl Wilson wrote that Phipps was working for the Federal Theatre Project: he headlined his article "Wampas Ex-Baby Lives On WPA $23 - And Likes It." About old film stars, someone once said "they had faces then." As it turns out, they also had stories to be told. Thomas Gladysz is an arts and entertainment writer. He is also the founding director of the Louise Brooks Society, an online archive and international fan club launched in 1995. In 2010, he edited, wrote the introduction, and re-self-published the Louise Brooks edition of The Diary of a Lost Girl, by Margarete Bohme. Recently, he contributed the audio commentary to the 1929 Brooks' film based on Bohme's book released by Kino Lorber.